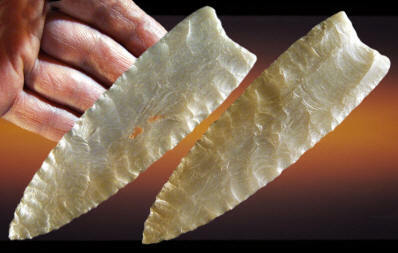 This Clovis point was found several years ago in Utah by Greg Nunn. It's a good example of a western style Clovis point or knife. Some of the flaking is oblique and the base is shallow. One side has a large flute flake that is 1 3/8 inches (3.5 cm) long. There are also two small spots of encrusted red ochre that indicates this point may have been in a cache. This Clovis point is made of semi-translucent gray/brown chalcedony and measures 5 3/16 inches (13.2 cm) long and 1 1/2 inches (3.8 cm) wide.